Downtown Reno is bleak. It calls itself the “Biggest Little City in the World,” a name left over from a different legal and moral era, when the economy rode high on gambling and out-of-state travelers seeking divorce. That fortune has long since ebbed, and on Virginia Street, Reno’s main drag, the casinos keep company with pawnshops and liquor stores. The pawnshops generally seem to be doing better than the casinos. But an economic and technological revolution is supposed to be coming. Out in the desert, Tesla is building—and building, and building—Gigafactory 1, designed to be the largest factory in the world, churning out batteries to fuel a would-be electric empire. The fate of Tesla rests in large part on the Gigafactory. In order to survive as a going concern, Tesla needs to build its car-for-the-masses, the Model 3, in enormous volumes. In order to build that many cars, it needs more lithium ion batteries than the entirety of global production in 2014. In order to build that many batteries, it needs what is eventually supposed to be the largest manufacturing facility ever made under one roof, with 10 million square feet of floorspace when finished the equivalent of more than 200 football fields. The factory is supposed to employ 6,500 people when it reaches its peak, which would make it the second-largest employer in the area after the local school district. Tesla received $1.3 billion in subsidies from the state of Nevada for locating its factory there. 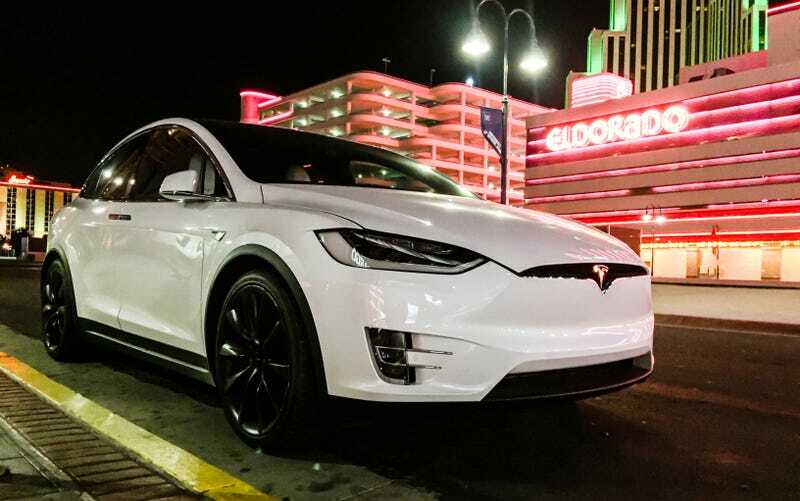 In late July, Tesla invited journalists to come and see its progress toward bringing Reno back. At around 10 p.m. on a Monday, I walked out into mostly empty streets, with vast sidewalks meant for absent crowds, or for crowds that had never arrived. Thousands of watts poured through casino lights shining on nothing in particular. It felt overbuilt in every way. Outside the Silver Legacy Casino, George Michael’s “Careless Whisper” was playing, so forlornly apt I was afraid it was on a loop. I headed away from it to the Cal-Neva Casino, where the signage emphasized the cheap meals. Across the way was an empty souvenir shop, with three homeless people sitting outside. The Cal-Neva carpet was stained and frayed, and the interior smelled of cleaning products and decades of accumulated menthol cigarette smoke. I sat down for a few rounds of five-dollar blackjack. Next to me were Rachael Caron and Devin Smith, both Reno natives, both 22 years old. Devin was a student at a local university. Rachael was a bartender and manager at JJ’s, a pizza place a few blocks away. After we’d played a while, I asked what they’d heard about the Tesla project. “It’s really big,” Devin said. “It’s so big, like a gigafactory.” She said she had a friend who had helped build it, but that Tesla had fallen through on its promises about jobs. “What sort of promises?” I asked. Devin said she didn’t know. “It’s good for Nevada, I guess,” she said. Tesla’s tour of the Gigafactory began at noon. To kill a few hours in the morning, I headed to the National Automobile Museum, which is within walking distance from the main Reno strip. But since it was a car museum, I drove. I do like cars, after all. The National Automobile Museum, despite the word “national” in the title, isn’t some sort of official car museum of the United States. It’s not part of the Smithsonian Institution like the National Air and Space Museum or anything. Most of it is based on the collection of William F. Harrah, the founder of the Harrah’s casino empire, who died in 1978. The newest car I could find was a replica of a 1988 Jaguar XJR-9. The newest non-replica I saw was a gold-plated DeLorean DMC-12, created for an American Express promotion, greeting visitors right at the front of the museum. But what the museum lacks in modernity, it makes up with in individuality. There’s a 1908 Franklin, which looks like a car wearing a top hat, and the truly stunning Phantom Corsair, and the truly odd Dymaxion. Really, there is no better way to declare one’s own greatness. On the way out, having seen a Jeep Grand Wagoneer with a Ferrari V8 mounted in the front and Caitlin Jenner’s Porsche 935 race car, I stopped at the front desk. It was manned by Matthew Andrew, the retail manager for the museum. Soft spoken and with kind eyes, he said he had grown up in Reno, moved to the San Francisco Bay Area for a while, and had moved back last year. “Reno, it’s a gambling town. That was the industry,” he said. Because of that, the city was usually either flying high or crashing and burning. Gambling is frequently the first thing people give up in a recession, he said, and it’s the last thing people go back to on the rebound. Much of the casino industry on Reno isn’t built upon any new demand for gambling. “It’s just the longevity of what was here before,” he said. But Tesla’s Gigafactory, Andrew said, is less the catalyst for economic change than a byproduct of it. Besides the Gigafactory, he pointed out the work of a company called Switch, which is building a billion-dollar, three million square-foot data center (planned to be the largest in the world) right next to the Gigafactory. Apple is planning on erecting a 14-building data-center site out in the desert, too. And those companies aren’t just erecting soulless factories and data centers, either. Rob Roy, the founder and CEO of Switch, has also brought in the Innevation Center, a small-business and entrepreneurial incubator. The Center, a 65,000-square foot community workspace, not only offers boring old meetings rooms, but also 3D printing and CNC machines for rapid prototyping. All of this has been introducing not just economic changes, but cultural changes, Andrew said. Home prices have surged in the past year—something others in Reno had told me, and which is supported by a nearly 14 percent home price increase over last year, according to Zillow. But Andrew said he didn’t know if it was all for the best. “I moved back about a year ago, because the pace of the Bay Area is unbelievable,” he said. “There’s traffic everywhere, there’s always a hustle, you always feel like someone’s trying to take advantage of you. And I have a very small fear that that’s what Reno’s going to start to see someday. The Gigafactory isn’t in Reno proper. It’s not even in Sparks, Reno’s main suburb, where Tesla says it is. Maps and locals place the site closer to the town of Fernley—about a half hour drive from downtown Reno, just off of Interstate 80, a two-lane highway with a 70 mile an hour speed limit surrounded by yellow scrub brush. The shuttle bus driver taking us there from our hotel asked us for directions at one point. We saw a small herd of four skinny wild horses on our way in. Tesla’s holdings out in the desert currently amount to 3,200 acres, roughly five times the size of the state of Monaco. 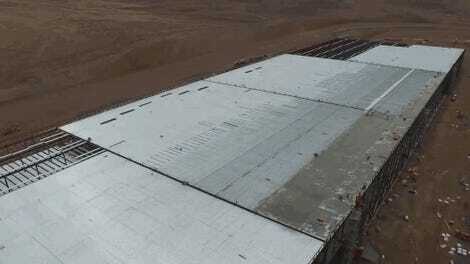 Even though it’s only 14 percent finished, the Gigafactory facility is already immense. Its current footprint is 800,000 square feet, with 1.9 million square feet of floorspace across its multiple levels. When finished, Tesla says it’ll be the largest building in the world. But it’s not saying when that will be. More than 800 construction workers, at least 70 percent of them permanent Nevada residents, the company said, toil away in two shifts to try to get everything ready for battery production, scheduled to ramp up to full-rate in just a few weeks. Production has already been accelerated. Batteries for 500,000 cars were originally scheduled to be produced by 2020, but now, with 400,000 orders for the Tesla Model 3 already placed, that’s been moved up to 2018. By that year, the battery output from the factory is supposed to exceed 2014's entire global production. Rather than waiting for the walls of the factory to expand naturally, as space requires it, whole sections are being built independent of the currently standing structure. They’ll be absorbed into the Gigafactory once its walls expand further, like it’s the world’s largest amoeba instead of a place that’s just supposed to make batteries. Before we got a look at the inside of the Gigafactory, we were invited to take a drive around the exterior with a Tesla employee who asked not to be named. Trucks bearing water tanks were spraying the hot, dry ground with water just to keep the dust down. It’s weird to tour a building by driving around it, but it helped. You need be far away from the Gigafactory to take in just how large it is, and the entire thing starts to mess with your size of scale. It doesn’t seem that large after a while, until you realize the little specks moving next to it are people. Even the bit of the building that’s standing and getting ready to produce batteries isn’t “complete” as a building. The east wall is the only exterior wall that will still be there when the project is done. The others, though they stretch more than a mile into the distance—already, the Gigafactory is more than a mile long—are temporary placeholders. Rather than simply expanding the current building outward as its need for space grows, Tesla is building separate sections independently, outside the present walls, to be absorbed into the Gigafactory factory as it spreads to meet them. For all of its boasts and dreams and projections, Tesla is keeping the cards in its current hand very close to the vest. And the size of the Gigafactory isn’t the result of some unnecessary showboating, or a sign that Elon Musk has some weird ego trip going on. Tesla says the scale is necessary to make the economics of it all work. By building one enormous factory, the company estimates it can reduce the cost of batteries by at least 30 percent. It’s a little unclear whom exactly the factory’s employees will work for. The Gigafactory will run in an unusual manner, at least for Tesla, one that’s different than the original factory it owns and operates in Fremont, California. I was repeatedly told by Tesla employees that it would be an “owner/lease” relationship in which Tesla owns the factory, while Panasonic, the Japanese electronics giant, makes the batteries in it. Once Panasonic has made the batteries, Tesla will ship them out to California to be put into cars. It seems to be a wise relationship, considering the stakes. If the Gigafactory can’t produce batteries, then Tesla can’t produce the Model 3. If Tesla can’t produce the Model 3, even Tesla admits the company has a chance of failure. Given Tesla’s history of production issues, putting battery production in the more experienced hands of Panasonic makes sense. On site, Panasonic employees wear blue hard hats and Tesla employees wear red ones. Before the press entered the building, we were issued red hard hats, along with high-visibility vests. We were also instructed that the opportunities for photographs would be extremely limited, as would information about the details of what we’d be looking at. Huge anode and cathode production machines lurked behind comparatively tiny windows, still wrapped in plastic. They had to be kept in rooms controlled to have less than one percent relative humidity, a Tesla spokesperson told us, and the machines were 38 feet tall. “How long are they?” I asked. In my head, I guessed that they were at least 150 feet long, and probably longer than that. I was told that the actual length of the machine was proprietary. There were vast rooms filled with racks intended for completed battery packs. When the factory was up and running, robots would be scurrying to sort and transport them all. In one long, wide corridor was machinery that we were told would be the first battery assembly line. The long, wide corridor that we had walked down beside it was intended for the second battery assembly line. As soon as one assembly line was finished, work on the other one would begin. We were shown a single battery cell, which looked a bit like a shiny metal shotgun shell. I asked if I could take a picture of it. The Gigafactory is on phase two of construction, we were told. There was no publicly available timetable, and Tesla would not even say how many phases there were. At the end of our tour, we’d been there for an hour, and had walked almost two miles. A full tour of the entire existing facility would take five to six hours, we were told. Nobody I spoke to seem too concerned about the gaps in the information. Elon Musk’s enormous success outweighed any of his failings. All would be right in the end, they said. Here was a great moment, at a great time, for a great city. It’d be hard to see how it wouldn’t work. But oddly, it’s not apparent that Reno needs to trust in Musk and Tesla. The Gigafactory might be transforming the scale of battery manufacturing, but it’s not leading the transformation of Nevada. Not alone, anyway. From that unemployment rate high of 12.9 percent in 2010, the Nevada Department of Employment, Training, and Rehabilitation says that the Reno area’s unemployment level is already down to just 5.6 percent. Already, 217,100 people have gotten new jobs. Only 12,956 people need jobs. The population is supposed to grow 7.1 percent by 2019, whereas in comparison the entire country has seen less than one percent population growth for more than a decade now. When the recession hit, the local gambling industry had already been slowly draining away, first to the ever-growing casinos of Las Vegas and then to the nationwide movement for other states to legalize gambling. Twenty-five years ago, 25 percent of the city’s businesses involved gambling. Now it’s down to eight percent. Reached by phone, Kazmierski said that rather than wait for the slow, tortuous death that had faced so many places reliant on a single industry, Reno looked elsewhere. Its very emptiness, city planners realized, meant that it had plenty of capacity to supply water and electricity. And if Americans no longer needed Reno as a getaway for gambling or divorce, it still was a getaway—one of the few places within a one-day drive of 11 western states. In short, by accident, Reno was built for logistics, manufacturing, and distribution. “It wasn’t by choice, it was for survival,” Kazmierski said. So the logistics industry, once non-existent, now makes up somewhere between five and 10 percent of the local economy. The Gigafactory alone is expected to add another five percent to that tally. As it is, the city’s already at 5.9 percent unemployment, and expects to hit full employment in just 18 months, just as the Gigafactory is starting to truly ramp up. Tesla has tripled the city’s normal growth rate, Kazmierski said, but even if it collapsed tomorrow the city would still be steaming ahead at double its historical growth rate.